I wasn’t expecting to care so much. When I got the call from Intel’s head of HR in 2006, asking me to come help with employee communications during the major corporate restructuring that was under way, I had been with the company for 11 years, working in external communications roles. I had spent my time representing Intel’s interests to the outside world of media and analysts. I was used to taking on the persona of my employer—advocating for the company’s strategies, technologies and products—but it was always to those external audiences. I knew I’d always felt a kind of quasi-parental responsibility toward the teams of people I’d led (sometimes, I’m sure, annoyingly so to those who worked for me). But I’d never given a thought to the mindset of the entire employee population of Intel. I’d never reflected on the state of “health” of the tens of thousands of Intel employees around the world; never wondered what they felt about the company, worried about, dreamt of, wanted or needed. I thought this job was simply another communications assignment, with a specific audience: employees. I never expected how important those employees, those humans, would become to me, and how differently I’d come to see this “communications” assignment. That role, as director of worldwide Employee Communications for Intel, consumed my work life from 2006 to 2011. One question drove me: What does every employee need to thrive? My best answer: She wants to believe in the organization’s purpose, belong to a team of people helping one another soar, and trust that she matters to the organization in two ways: she is essential to the team’s success, and she feels valued by the leaders of the organization. During that 2006-2011 period, my team and I used this framework of “believe, belong and matter” to focus our programs and messaging and to remind ourselves of what was most important, to our employees and to our work. This framework isn’t about happy talk or misty-eyed hugs. Those are fast ways to lose credibility and exhaust employees emotionally. It is about describing the company’s honorable purpose (or developing one first if needed). Reminding everyone, regularly, that we thrive best if we support one another to thrive together. Making clear what every person’s contribution is (and can become), and demonstrating that the humans making those contributions are appreciated and supported. The lens of “believe, belong and matter” is a way of looking at the opportunity—the obligation—to help employees thrive. 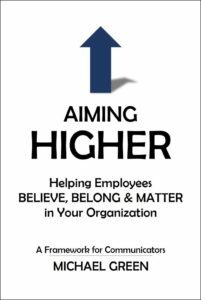 It’s a framework that I explore in my book Aiming Higher: Helping Employees Believe, Belong and Matter in Your Organization. Professionals, scientists, researchers and authors of all kinds offer blueprints, practices and disciplines that may resonate with you and help propel your momentum. Training and development models, the organizational application of scientific research in physiology, psychology and neurology, the intersections of societal changes and business strategies—all offer riches to be harvested. Use them all. I don’t suggest the “believe, belong, matter” framework should displace them. But my experience tells me it can help focus and fuel any other system designed to build employee strength in organizations of any size, industry or culture (even if you’re trying to change your culture). All communicators, from executives and managers to communications professionals, from business group leaders to HR practitioners, have the opportunity—the obligation—to step up to help employees thrive. It’s a wonderful opportunity—and a serious obligation. Why attempt any less?